53. Attract bluebirds and other insectivorous birds. UPDATE: Julie Zickefoose has developed an improved dough for feeding bluebirds that is nutritionally complete. Her new recipe is excellent. Bluebirds have long been treasured by Americans. Their pleasing songs, lovely plumage, and gentle ways make them one of the most popular songbirds. Clearings for native and colonial settlements and especially farms and orchards provided ideal bluebird habitat for both feeding and nesting. Bluebirds hunt in open fields by perching in dead trees or on stumps (fence posts are perfect), dropping to the ground for insects. Also, woodpecker holes in fence posts and natural cavities in apple trees make ideal nesting sites. But beginning in the 1940s and 1950s, several changes in agricultural practices made farms less hospitable for bluebirds. Farmers started treating damaged tree limbs before diseased branches rotted away to provide natural cavities. At the same time, more farmers built fences with metal posts. And even worse, farmers began using pesticides. Meanwhile, the exploding populations of introduced House Sparrows and European Starlings produced greater competition for the dwindling number of potential nest cavities. Although one of the worst pesticides for birds, DDT, was banned in 1971, other insecticides still in use can hurt bluebirds and decimate their food resources. Providing nest boxes and limiting pesticide use have improved bluebird population levels greatly. But monitoring bluebird boxes and cleaning them out at the end of the breeding season furnish sad proof of the hardships caused by extremes in weather: the desiccated bodies of bluebirds and their eggs or nestlings. Starvation and hypothermia during unusually cold springs are the normal causes of mortality in bluebirds. Although bluebird populations can flourish despite seasonal losses, dead bluebirds seem a heartbreaking waste, especially when there are ways to help them. Birds survive cold temperatures much more easily when they have plenty of food and stores of body fat, which provide the energy needed to shiver, thus heating their bodies and preventing hypothermia. Providing food for local bluebirds greatly increases the chance of them making it through bad weather. The best food to offer bluebirds is mealworms, the larvae of small, black, flightless beetles belonging to the genus Tenebrio. They’re agricultural pests that infest flour and other grain products. They’re available in pet shops, bird feeding stores, and sometimes bait shops but are cheaper to buy in quantity from mail-order companies such as Grubco or Rainbow Mealworms. It’s important to keep in mind that mealworms are part of a food chain. If there are toxins in their tissues, those toxins will be transferred to the birds that eat them. Mealworms ordered through the mail usually arrive packaged in wadded newspaper. Transfer them to new quarters as soon as possible to minimize the amount of toxic newsprint ink they consume. 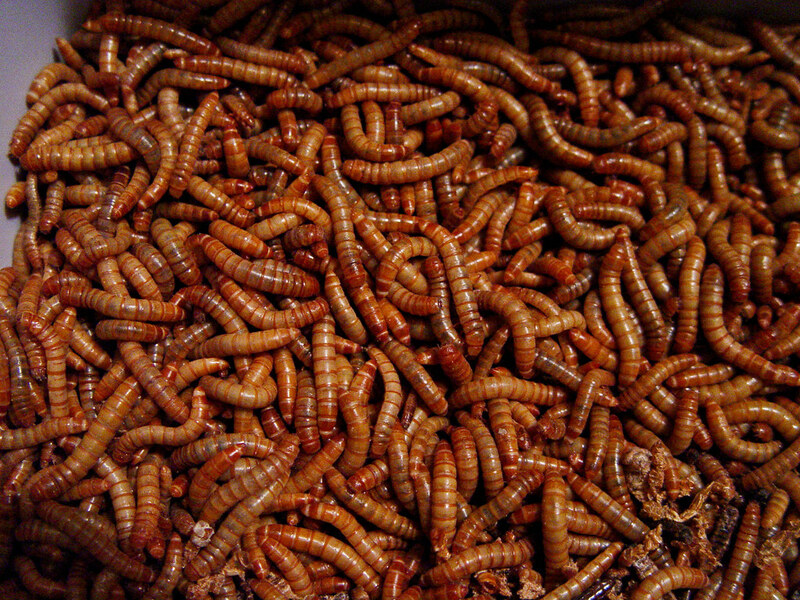 House mealworms in plastic buckets with an inch of oatmeal, cornflakes, cream of wheat, wheat bran, or other dry grain product on the bottom. For moisture and vitamins, occasionally add pieces of raw potato, carrot, or apple. Particularly during spring and summer, boost your mealworms’ vitamin content by adding a baby-bird hand-feeding powder (such as Kaytee Exact, available at pet shops) to the mealworm bucket. If you don’t want the mealworms to breed, when they are close to maximum size, refrigerate them with some food to keep them alive but growing very slowly. Don’t freeze them—they get mushy when thawed and spoil very quickly. 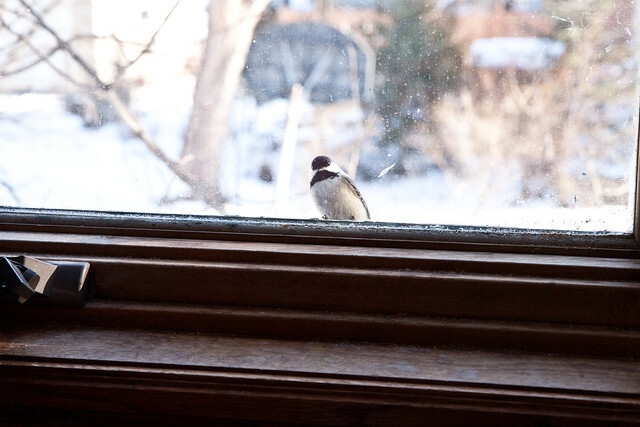 During severe cold spells, frozen mealworms stay fresh and are popular with birds, but when the temperature rises to the upper twenties and thirties, they quickly go bad. When the temperature hovers near freezing, you can set mealworms in a heated birdbath filled with sphagnum moss; adding fruit to the mixture makes this irresistible. 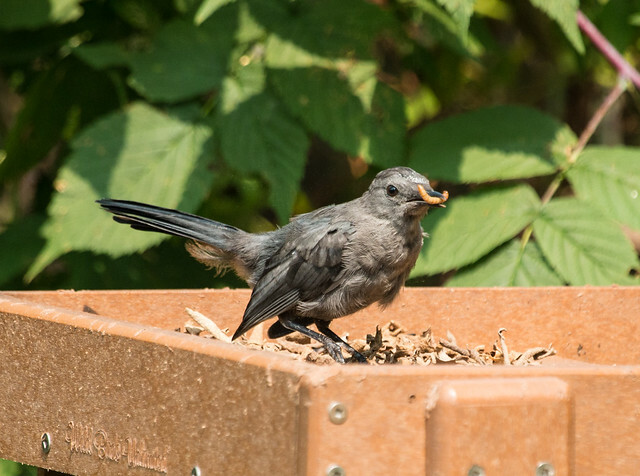 Providing enough mealworms to satisfy even a single family of bluebirds can become prohibitively expensive, so most people supplement the mealworm diet with other nutritious items. Bluebird conservation organizations provide recipes for suitable foods such as peanut butter, suet, sunflower hearts, grapes, cherries, raisins, currants, and other fruits. Bluebirds in many areas also appreciate calcium supplements, which are easily provided by setting out crushed eggshells (when not from hard-boiled eggs, bake for twenty minutes at 250 degrees). Bluebirds are not traditionally feeder birds, so it takes a certain amount of effort to get them to figure out what bird feeders are all about. Simply setting out wiggling mealworms on a low platform in view of a bluebird hunting perch will entice birds right away, but they’ll have lots of competition for those expensive delicacies. As soon as your bluebirds learn to associate the feeding tray with food, start using a feeder designed to exclude most other species. As cavity nesters, bluebirds naturally enter holes that other birds simply don’t, so most bluebird feeders capitalize on this by offering the food within some sort of small enclosure. Simple plans for bluebird feeders are available in Carrol Henderson’s bird feeding book and from bluebird organizations. Bluebirds aren’t the only birds that come to feeders for mealworms. 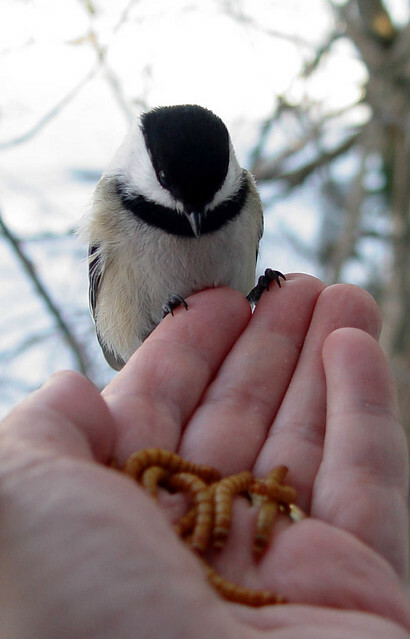 I’ve had chickadees and Red-breasted Nuthatches that quickly learned to take them from my hands. During the few springs that Scarlet Tanagers have appeared in my yard during migration, they’ve eagerly come to window feeders for mealworms. I’ve also enjoyed watching woodpeckers, jays, thrushes, catbirds, Chipping and Lincoln’s Sparrows, vireos, and warblers eat mealworms. 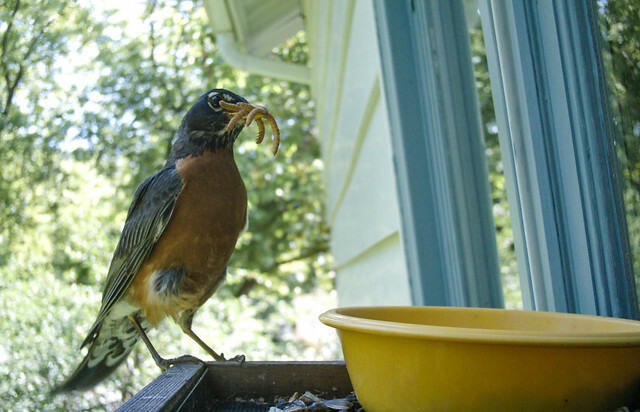 Do mealworms entice birds to stay at feeders longer than they normally would? This is highly unlikely. Many species time their migration to coincide with the period of richest food supplies, regardless of whether feeding stations are around. Although I keep mealworms available throughout the spring and fall migration, I’ve never had migratory species from summer stay longer than they normally would, and I’ve never observed spring or fall migrants in my yard later than normal. In winter, mealworms may well sustain some out-of-range individuals that would otherwise die, but there is no evidence that this contributes to the passing on of genetic weaknesses. Of course, we should never feed birds that show any signs of sickness (rather than injury) at a feeding station, where illness can quickly spread. Sick birds should be taken to a rehabber.